Many films have been adapted from graphic novels. Usually they become sci fi, thriller, action films rather than animated versions of themselves. Persepolis is an award winning animated film from the autobiographical graphic novel by Marjane Satrapi. Filmmakers Vincent Paronnaud and Marjane Satrapi collaborated to co-write and co-direct this adaptation of Satrapi's bestselling autobiographical graphic novel detailing the trials faced by an outspoken Iranian girl who finds her unique attitude and outlook on life repeatedly challenged during the Islamic revolution. The English-language version features the voice talents of Sean Penn, Gena Rowlands, and Iggy Pop, with Catherine Deneuve and Chiara Mastroianni reprising their roles from the original French-language version. The film won the Jury Prize at the 2007 Cannes Film Festival. In her acceptance speech, Satrapi said "Although this film is universal, I wish to dedicate the prize to all Iranians". 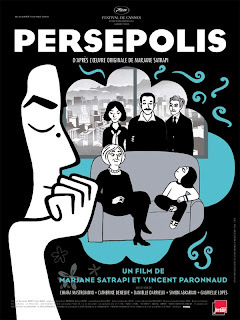 Persepolis was also nominated for the Academy Award for Best Animated Feature.